This Mass marked the 40th Anniversary of the coming into effect of the Abortion Act. It was offered in conjuction with the monthly prayer vigil which takes place outside this church, which happens to be by the entrance of the only place in Oxford where abortions take place, the John Radcliffe Hospital. The Mass and Witness were particularly well-attended this month. Many thanks to the organiser, Amanda Lewin, to the celebrant, Fr John Saward, and the parish priest of St Anthony's, Fr Aldo Tapparo. 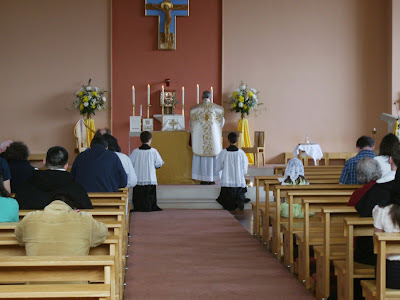 It is interesting and heartening to see the Traditional Mass in this modern church.